Stories with a male protagonist seem to be slim pickin's these days, so I was excited to pick up this comic-book themed novel. 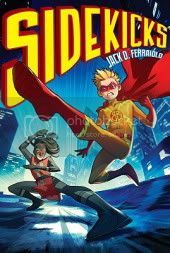 Middle-school student Scott Hutchinson, better known as Bright Boy, is the sidekick to world-renowned superhero Phantom Justice. Superheroes are now referred to by the more scientific appellation plus/plus. Supers can have super strength, speed, intelligence, or some combination of all three. Witty repartee, "punny" insults and other cheesy dialogue is part of the territory, along with standard-issue tights and capes. The problem is, Bright Boy has outgrown his traditional yellow and red outfit, and much to his mortification and dismay, after saving a particularly gorgeous young female hostage from a supervillain, his super-tight tights leave nothing to the imagination. Humiliated, he begs Phantom Justice's permission to update his costume, and is roundly refused. Thus starts his rebellious streak... before he realizes it, he's hanging out with Monkeywrench, the sidekick to Phantom Justice's archenemy Dr. Chaotic. Monkeywrench, aka Allison Mendez, is probably every young man's dream - beautiful, daring, and she knows what she wants. She and Scott share several kisses, nearly all of them initiated by her. One feature I loved about this book was that the meetings between supervillains use black pages with white type. There were plenty of twists, turns and sudden reversals towards the end of the book, some of which I saw coming, and others which I never could have predicted. I had expected one of Scott's teachers to reveal that she was a superhero, but nothing seemed to come of that, although I was surprised by a few of the other characters' hidden abilities. I'll recommend this to comic book aficionados looking for a lengthier read, or anyone looking for a funny, action-packed book with a hint of romance. I know it's a book that I'll want to read and re-read. Check out the book trailer for an idea of inspired hilarity contained within.